Two years before the fire, Dorie won the NSBA high point in the Limited Open Western Pleasure. With her earnings, she considered buying a big rig horse trailer complete with sleeping quarters. Wanting to spend her earnings wisely, she talked the decision over with a few close friends and after much prayer decided the rig was a good investment. Little did Dorie know then what a blessing that rig would be. After the fire, that big rig trailer became her home. She moved the rig from her 10-acre ranch in Greenville to Canton to be closer to her parents. Shortly after moving to Canton, she met and married Jeff Hilliard and moved to his ranch. In the spring of 2017, another disaster threatened to hit their property. One spring evening tornadoes ravaged through Van Zandt County and seemed to concentrate on the city of Canton. The Hilliard property was one of many caught in the path of this storm. Jeff and Dorie, along with their two children huddled in an inner room, praying, while the storm raged outside. Their house fared well, only suffering minor roof and water damage. However, their property was hit harder. Trees that had dotted the hill line for years were suddenly destroyed. Jeff’s shop was completely leveled, two barns ruined and two animals killed. One day Jeff and Dorie drove by the Ameristall display barn on loop 564 in Mineola on their way out to Lake Holbrook. From then, that display barn became a frequent stop when they were out driving around after church on Sunday. “I can’t tell you how many times we stopped and looked at that barn! And we didn’t even need one at the time!”, remembers Dorie. Yet the thought of a barn close to their house kept rolling around in their head. Dorie loves horses even though she doesn’t show anymore and wanted a barn she could work her horses in and be protected from the weather. Finally, they called Johnny Kerby to come take a look at their property and see where the best place for a barn might be. 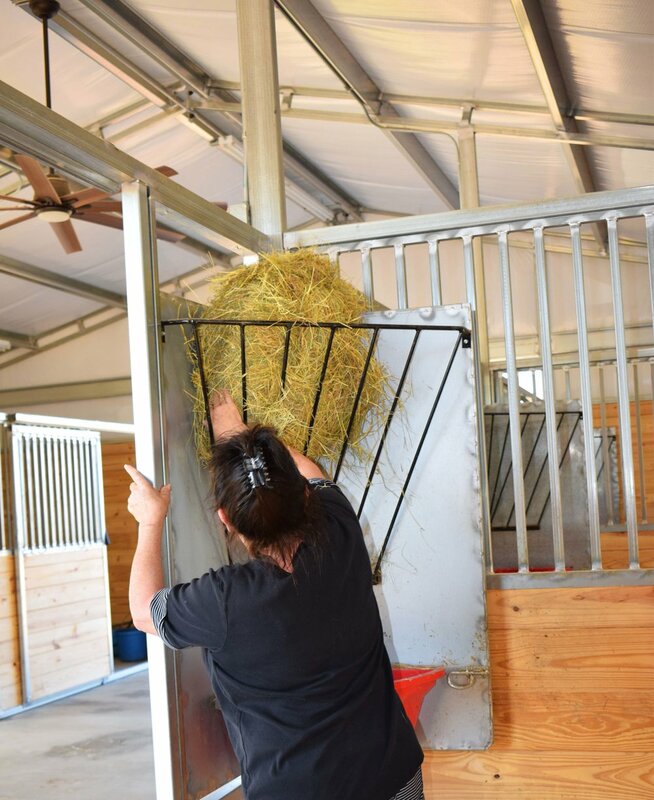 Dorie and Jeff are very pleased with their new barn and love how it has sparked their kid’s excitement. The first night the barn was finished, the kids were out in the stalls brushing and taking care of the horses. Dorie had no idea all the drive-bys to the display barn would one day land her a barn on her property. “That wasn’t the plan,” she said. “But we love our barn and the horses like it too. They feel at home here. ...And there’s nothing better than feeling at home!" To Request a Quote or to speak to one of our Project Managers, please tell us a little more about your future project by clicking the button below and answering a few questions for us! Our team is eager to come alongside you.